As a solution to the increasing traffic woes of the capital the district administration has ordered schools to promote car polling. Taking a step further, the administration has told schools to penalize/fine vehicles which come to drop a single sibling. Even teachers would be taken under this ambit. They too have to pool cars with fellow teachers or students. Some schools of the capital are operational these days, while most would resume from March 1st week. Thereafter morning and afternoon traffic snarls of the city attribute to the traffic plying for pickup and drop of kids to school. While the Deputy Commissioner office has shifted their load by making school administrations liable for promoting car polls, but sources claim those schools are finding it an uphill task. 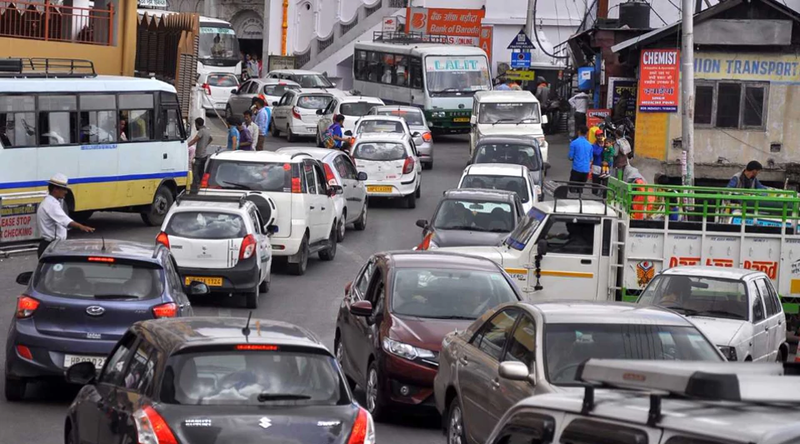 Sources from an eminent school of Shimla (Loreto Convent Tarahall) inform that though they had already started promoting car poll since the previous year, yet monitoring the same was not easy. These sources say that they had banned entry of those vehicles in the school premises, which were dropping single child. Yet many continued dropping single child. They say that when these vehicles were banned from entering into school premises, they started dropping kids outside the school gate, thus forfeiting the entire objective. “Then how can the school administration monitor, if kids are dropped outside the gate?, Questioned the sources. The sources say that though the school management can promote car pooling, yet practically monitoring the same is never easy. As the cameras and security guards can only keep an eye on vehicles coming inside premises to drop child, they added. Talking of reasons about this system not gaining practical grounds these sources say that they are multiple. In today’s nuclear society, many parents find it hard to collaborate with others in their areas for a car pool, children nowadays have entered the blind race of showcasing their vehicles among fellow kids, are among the few. “Moreover walking habits have almost faded, as many living in the core city like Mall Road, Yodha Niwas, etc are also witnessed dropping their child to school in a vehicle,” they added. “I too would want to send my child in a school van. But the way it stacked with over numbered kids, is discouraging,” stated the father of a 15year old. Therefore I am left with no other option than drop my kid to school myself,” he added. I even tried walking to school but the dog and monkey menace stalls it too, he rued. He said that use of public transport is a solution, but only if the parents are assured of safety and comfort for their child, summoned this father. However the school sources say that the district administration should help schools implement the concept. They suggest that an area of 100 meters should be earmarked around the school premises. In case any vehicle is witnessed dropping a single child to school in this area, then they should be warned or fined. But this could only be done if the local police and administration plays an active role initially, added sources. These sources add that the most difficult task is to convince important stakeholders of the system like the rich, bureaucrats and politicians, who drop their child to school single seat even after repeated requests. “Evidently these are the ones who can pool more number of kids as they have the resources line bigger cars/jeeps/SUVs,’ asserted sources. And if this pool concept attempt is successful, then even the over load of school vans can reduce, they explained. Though the schools can conduct awareness seminars, forums, etc to enlighten people towards car pool, yet implantation would still depend of the parents, as legally managements cannot levy any penalties/fines on such vehicles. They say that unless parents start realizing that car pool would benefit the city today and in days to come, a concrete practicable solution might not be possible. That’s not the problem. The problem is pedestrians, people who are walking just anywhere and everywhere. Abroad pedestrians walk on pedestrian paths only, and the traffic thus runs smoothly. If some rules are made and imposed strictly on pedestrians the problem of traffic will be solved 75%. Until then whatever you do it’s not going to help.